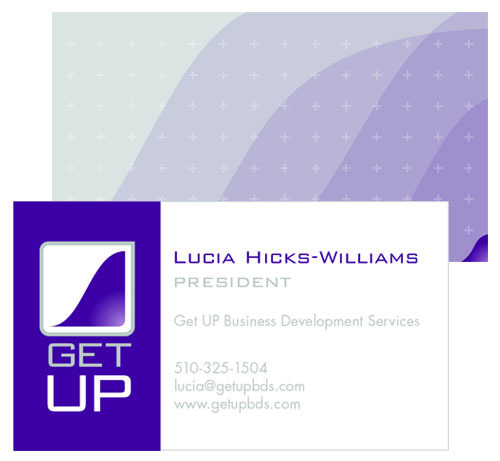 We started by redesigning her logo to convey the difference Get UP brings to the table, and how their strategic guidance can help businesses generate more revenue, as expressed in the upward revenue curve graphic embedded in the logo. We also updated the color palette with tonal adjustments to lend a modern, warm feel. We translated all of these new elements into beautiful, new two-sided business cards with space for notes on the back for increased functionality. We extended her brand to a completely redesigned website. 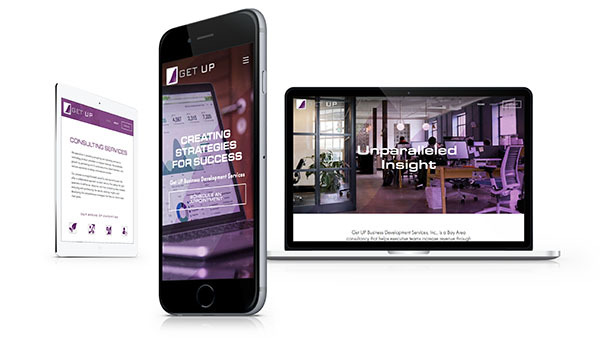 We slimmed it down to three robust pages filled with compelling reasons to choose Get UP—from powerful metrics of client success to outstanding testimonials. We curated beautiful imagery that we treated with a custom overlay to reflect the Get UP brand colors and a bespoke texture that ties into the revenue curve in the logo. The site copy features a direct, straightforward style designed to confidently convey the firm’s expertise while being jargon free and easy to understand at a glance. To top it all off, we developed powerful SEO to aid in the new site being found and well ranked by search engines. We loved working with Lucia, and she’s delighted with the results she’s seeing from her site and new clients. We look forward to helping her with her additional marketing needs in the future.